Archaeologists working in the Kenyan desert badlands have discovered dozens of stone tools crafted about 3.3 million years ago, the earliest evidence ever of technology on Earth. For many years, many scholars believed the first stone tools were devised by the genus Homo—a line that leads directly to modern humans—and it was the mental leap of smashing stones together to form rudimentary cutting tools that proved crucial for our evolutionary success. A human species armed with such tools, for instance, would find it easier to acquire food by cutting meat from animal carcasses. 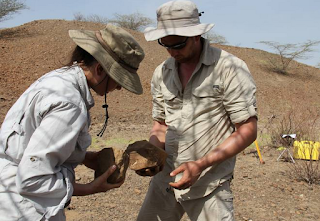 “The significance is that it takes away one of the defining characteristics of our genus and shares it with other groups,” said study co-author Jason Lewis of the Turkana Basin Institute and Rutgers University. "It will force us [to rethink] what makes us humans," Fernando Diez Martin, a University of Valladolid associate professor who was not involved in the study, told The Verge in an email. He adds, "Increasing knowledge of our remote past is casting doubts on previous certainties and is showing that the process of becoming what we are now is far more gradual than what we previously thought."